I went to see this movie for the Frozen short at the beginning. I had no idea it would be as fantastic or surprising as it was. Reading other reviews, I agree that the traditional approach by Branaugh is refreshing in an age of heavy revisionism. But the acting, tone, and message were also incredible. Blanchett made a superb evil stepmother and Robb Stark- I mean the Richard Madden- also blew me away. Apart from that, it did everything a fairy tale should do: it made me believe. The magic was tasteful, and not overblown; nothing appeared overly computer generated. It would have been easy to make the mice look cartoonish or grotesquely real. Mostly, however I loved the message: it was less girl escaping poverty and anything can happen than previous adaptations. This message seemed at once simpler and more powerful: have courage and be kind. This set it apart from other adaptations for me. 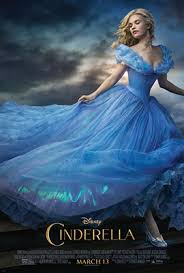 It was not merely Cinderella’s suffering and good nature, but her choices that mattered. These choices reflected onto nature and even her stepmother in the end. In an age of overblown and clumsy big Hollywood productions, Branaugh has accomplished something unique. I hope you see this movie, have courage, and be kind. This entry was posted in movie review and tagged blanchett, branaugh, cinderella, film review, movie review. Bookmark the permalink.